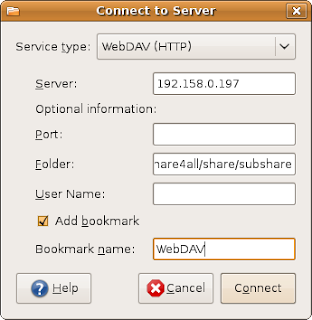 I could get the WebDAV working on openfiler to view the share thanks to Nautilus, the gnome file manager. I did not know about ubuntUlogy.blogspot.com. Looked up that link and it seems to be rather dated! Linux fever is building bhau and it feels good. But, it feels bad when a day goes off without any Linux stuff! Anyway, its good to see you stopping by and commenting! Thank you Bhau.